The Contraband Days Festival Changes Its Name On International Talk Like a Pirate Day 2017 - Louisiana Pirate Festival in Lake Charles! LAKE CHARLES, La. (September 19, 2017)—For six decades, the Contraband Days Festival in Lake Charles has brought pirates, carnival rides, music, traditions and merriment to the lakefront. However, the festival is entering into a new era, embracing all that is “Louisiana” along with the folklore and beauty that surrounds the Lake Charles area. 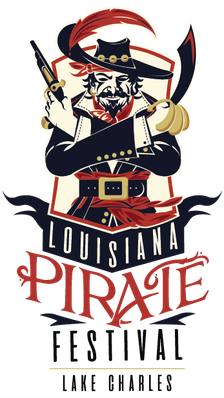 With its new focus on Louisiana culture, it is fitting that on International Talk Like a Pirate Day, the festival is changing its name to become the Louisiana Pirate Festival. “The board felt that this name change would be a true reflection of the shift that is taking place with the festival itself. We have incredible food, music and artists in Louisiana, and everyone sees this as an opportunity to celebrate the best of who we are as a people and culture. Right on the shores of Lake Charles, the Louisiana Pirate Festival will bring a more statewide appeal, moving past the 60th anniversary. It’s time for something new and different,” said Russ Grantham, president of the Louisiana Pirate Festival. The festival’s website is currently under construction, and there will be an announcement later for the website reveal that will showcase the spirit of the Louisiana Pirate Festival. For more information, contact the Louisiana Pirate Festival office at (337) 436-5508 or send an e-mail to info@louisianapiratefestival.com.